Pacor 1 F., Paolucci 2 R. and RUs-S4 (1) Istituto Nazionale di Geofisica e Vulcanologia – Sezione di MILANO – (2) Politecnico di Milano ABSTRACT The occurrence. 1 Pacor 1 F., Paolucci 2 R. and RUs-S4 (1) Istituto Nazionale di Geofisica e Vulcanologia – Sezione di MILANO – (2) Politecnico di Milano ABSTRACT The occurrence of the LAquila earthquake, has promoted within Project S4 several activities, stimulating some reflections on the way the Project itself should move on to comply with the requirements coming from DPC and from the national and international scientific and technical community as well. All the RUs were involved and details on the performed investigations and results can be found in the RU- Posters Section RU1: INGV-MI, RU2: INGV-RM, RU3: POLI-MI, RU4: Poli-TO; RU5: Uni-BAS, UR6: Uni-RM1, UR7: Uni-SI, UR8: GFZ Fig.2 Fig.1 http://esse4.mi.ingv.ithttp://esse4.mi.ingv.it A section is devoted to release reports on the research activities and data collection about LAquila seismic sequence 1 As a first major contribution, strictly related to the main objective of the Project, a great deal of efforts was spent to publish in ITACA, within a short amount of time from the earthquake occurrence, the strong motion data from the mainshock and the 12 largest events (M > 4) of the sequence. About 900 waveforms were included, both in the uncorrected and corrected version, recorded by more than 65 digital stations. After publication of records, the ITACA web site performed well when facing a dramatic increase of the number of accesses and downloads, around 150- 200 visits/day, mainly from Italy but also from worldwide. 2 RU1 and RU3 contributed to analyse the characteristics of different strong-motion parameters as function of distance, azimuth and site conditions. Furthermore RU1 analyzed the strong-motion data set with the aim of evaluating source, path and site spectral parameters. 4 RU4, RU7 and RU8 applied active and passive surface wave methods for site characterization at accelerometric stations located in epicentral area, such as the AQP and AQA permanent stations, and Bazzano and Onna sites, where recording stations were installed after the mainshock. Insight on the response site at AQK station, located close to L'Aquila downtown, have been provided by the monitoring activity carried out by RU2 in the framework of microzonation study of LAquila town 5 RU5 together with RU8 installed several strong motion arrays to monitor the seismic response of buildings during the seismic sequence. Furthermore, RU5 performed noise measurements at ENEL cabins where accelerometric station were installed to be compared with strong motion data in order to evaluate the interaction with hosting structures. BIBLIOGRAFIA Ameri A., M. Massa, D. Bindi, E. DAlema, A. Gorini, L. Luzi, S. Marzorati, F. Pacor, R. Paolucci, R. Puglia and C. Smerzini (2009). The 6 April 2009, Mw 6.3, LAquila (Central Italy) earthquake: strong-motion observations, accepted for publication in Seismol. Res. Letters. Bindi D., Pacor F, Luzi L., Massa M. and G. Ameri (2009. 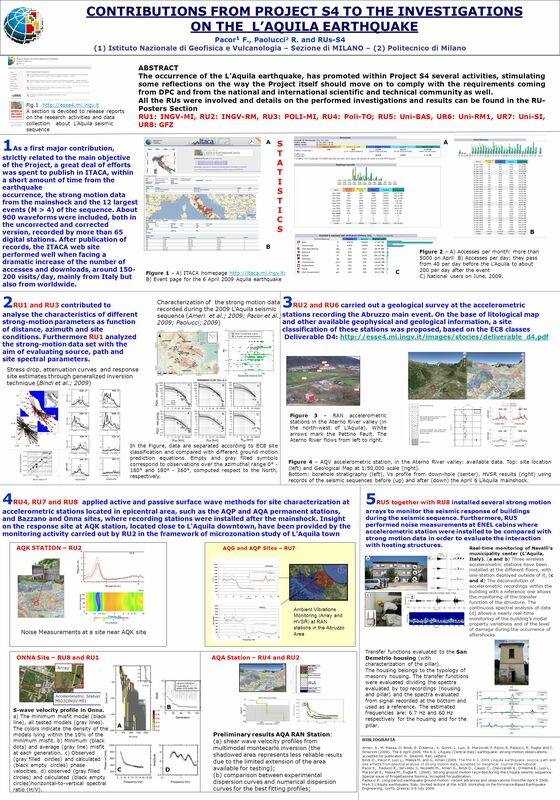 The Mw 6.3, 2009 LAquila earthquake: source, path and site effects from spectral analysis of strong motion data, accepted on Geophical Journal International Pacor F., Paolucci R., Iervolino I., Nicoletti M., Ameri G., Bindi D., Cauzzi C., Chioccarelli E., DAlema E., Luzi L., Marzorati S., Massa M., Puglia R. (2009). Strong ground motion recorded during the L'Aquila seismic sequence. Special issue of Progettazione Sismica, Accepted for publication. Paolucci R. Long-period earthquake ground motion: recent advances and observations from the April 6 2009, Mw6.3 L'Aquila earthquake, Italy. Invited lecture at the ACES Workshop on Performance-Based Earthquake Engineering, Corfù, Greece, 5-6 July 2009. 3 RU2 and RU6 carried out a geological survey at the accelerometric stations recording the Abruzzo main event. On the base of litological map and other available geophysical and geological information, a site classification of these stations was proposed, based on the EC8 classes Deliverable D4: http://esse4.mi.ingv.it/images/stories/deliverable_d4.pdfhttp://esse4.mi.ingv.it/images/stories/deliverable_d4.pdf Figure 3 – RAN accelerometric stations in the Aterno River valley (in the north-west of LAquila). White arrows mark the Pettino Fault. The Aterno River flows from left to right. Transfer functions evaluated to the San Demetrio housing (with characterization of the pillar). The housing belongs to the typology of masonry housing. The transfer functions were evaluated dividing the spectra evaluated by top recordings (housing and pillar) and the spectra evaluated from signal recorded at the bottom and used as a reference. The estimated frequencies are: 6.7 Hz and 60 Hz respectively for the housing and for the pillar. CONTRIBUTIONS FROM PROJECT S4 TO THE INVESTIGATIONS ON THE LAQUILA EARTHQUAKE Figure 1 – A) ITACA homepage http://itaca.mi.ingv.it; B) Event page for the 6 April 2009 Aquila earthquakehttp://itaca.mi.ingv.it A B STATISTICSSTATISTICS A C B Figure 2 – A) Accesses per month: more than 5000 on April B) Accesses per day; they pass from 40 per day before the LAquila to about 200 per day after the event C) National users on June, 2009. Stress drop, attenuation curves and response site estimates through generalized inversion technique (Bindi et al. ; 2009) Characterization of the strong motion data recorded during the 2009 LAquila seismic sequence (Ameri et al. ; 2009; Pacor et al. ; 2009; Paolucci; 2009) Figure 4 – AQV accelerometric station, in the Aterno River valley: available data. Top: site location (left) and Geological Map at 1:50,000 scale (right). Bottom: borehole stratigraphy (left), Vs profile from down-hole (center), HVSR results (right) using records of the seismic sequences before (up) and after (down) the April 6 LAquila mainshock. AQK STATION – RU2 Noise Measurements at a site near AQK site Ambient Vibrations Monitoring (Array and HVSR) at RAN stations in the Abruzzo Area AQG and AQP Sites – RU7 AQA Station – RU4 and RU2 (b) Preliminary results AQA RAN Station: (a) shear wave velocity profiles from multimodal montecarlo inversion (the shadowed area represents less reliable results due to the limited extension of the area available for testing); (b) comparison between experimental dispersion curves and numerical dispersion curves for the best fitting profiles; ONNA Site – RU8 and RU1 Array Accelerometric Station MI03(INGV-MI) A B DC S-wave velocity profile in Onna. a) The minimum misfit model (black line), all tested models (gray lines). The colors indicate the density of the models lying within the 10% of the minimum misfit. b) Minimum (black dots) and average (gray line) misfit at each generation. c) Observed (gray filled circles) and calculated (black empty circles) phase velocities. d) observed (gray filled circles) and calculated (black empty circles)horizontal-to-vertical spectral ratio (H/V). Real-time monitoring of Navellis municipality center (LAquila, Italy). (a and b) Three wireless accelerometric stations have been installed at the different floors, with one station deployed outside of it, (c and d) The deconvolution of accelerometric recordings within the building with a reference one allows the monitoring of the transfer function of the structure. The continuous spectral analysis of data (d) allows a nearly real-time monitoring of the buildings modal property variations and of the level of damage during the occurrence of aftershocks. In the Figure, data are separated according to EC8 site classification and compared with different ground motion prediction equations. Empty and gray filled symbols correspond to observations over the azimuthal range 0° - 180° and 180° - 360°, computed respect to the North, respectively. Download ppt "Pacor 1 F., Paolucci 2 R. and RUs-S4 (1) Istituto Nazionale di Geofisica e Vulcanologia – Sezione di MILANO – (2) Politecnico di Milano ABSTRACT The occurrence." Agreement INGV-DPC Project S4: ITALIAN STRONG MOTION DATA BASE TASK 3 Site characterization with surface waves methods RU8-GFZ in cooperation. DPC-INGV Project S4 – The Italian strong motion database DPC-INGV agreement Project S4 The Italian strong motion database Advisors from. CorrelationsComputational Geophysics and Data Analysis 1 Correlations Correlation of time series Similarity Time shitfs Applications Correlation of rotations/strains. B. Zolesi *, Lj.R. Cander **, A. Belehaki ***, I.Tsagouri ***, M.Pezzopane * and S.Pau * Istituto Nazionale di Geofisica e Vulcanologia, Italy; ** Rutherford. PREDICTION OF RESPONSE SPECTRAL PARAMETERS FOR BHUJ EARTHQUAKE (26TH JANUARY 2001) USING COMPONENT ATTENUATION MODELLING TECHNIQUE By DR. SAROSH.H. LODI. Operational Earthquake Loss Forecasting in Italy: Preliminary Results I. Iervolino, 1 E. Chioccarelli, 1 M. Giorgio, 2 W. Marzocchi, 3 A. Lombardi, 3 G.
Modeling Seismic Response for Highway Bridges in the St. Louis Area for Magnitude 6.0 to 6.8 Earthquakes J. David Rogers and Deniz Karadeniz Department. 3D NUMERICAL SIMULATIONS OF EARTHQUAKE GROUND MOTION IN SEDIMENTARY BASINS: THE CASES OF GUBBIO AND L’AQUILA, CENTRAL ITALY Roberto Paolucci and Chiara. Skopje, Oct 2012 Radmila Salic, MSc. 1 st Project Workshop and Kick-Off Meeting Improvements in the Harmonized Seismic Hazard Maps for the Western.